Texas Instruments introduced two new isolated CAN flexible data rate (FD) transceivers that combine high bus fault protection, high common-mode transient immunity (CMTI), and low electromagnetic emissions into a 35 percent smaller package. The ISO1042 and ISO1042-Q1 transceivers provide a higher working voltage than competing devices and faster communication speeds than the classic CAN standard, thus helping better protect low-voltage circuits and increase communication throughput in industrial applications such as grid infrastructure, motor drives and building automation, as well as hybrid electric vehicles and electric vehicles (HEVs/EVs). High working voltage: With an 18 percent higher working voltage of 1,000 Vrms and a withstand voltage of 5,000 Vrms, the ISO1042 and ISO1042-Q1 feature longer lifetimes, resulting in improved system reliability. Increased device protection: Featuring a high bus fault protection of ±70 V, which provides a 20 percent higher short-to-DC margin, the ISO1042 and ISO1042-Q1 protect 12-, 24- and 48-V battery or power-supply systems during high-voltage shorts. Highest electromagnetic immunity: The ISO1042 and ISO1042-Q1 feature a CMTI of 85 kV/us (minimum) with high ESD protection of +/- 8 kV, using the International Electrotechnical Commission (IEC) testing standard, which helps engineers design electronics that can maintain operation in noisy environments. Lowest EMC emissions: The ISO1042 and ISO1042-Q1 deliver the industry's lowest electromagnetic compatibility (EMC) emissions, thereby maintaining system signal integrity. The ISO1042-Q1 meets the automotive industry standard (IEC TS62228) for robust EMC. 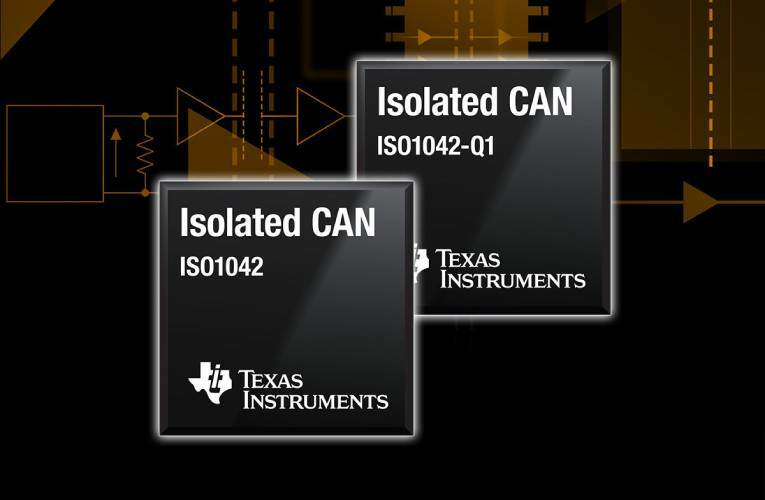 Drive signals faster in CAN-based systems: These transceivers support CAN FD speeds up to 5 Mbps with a short loop delay of 215 ns (maximum), enabling faster payload compared to classic CAN. The ISO1042 and ISO1042-Q1 are available now through the TI store and authorized distributors. Basic and reinforced options of each device are available in either a 10.3-mm-by-7.5-mm, 16-pin or a 5.8-mm-by-7.5-mm, 8-pin small-outline integrated (SOIC) package. Pricing starts at US$1.69 in 1,000-unit quantities for industrial versions and US$1.99 in 1,000-unit qualities for automotive versions. The evaluation modules for these devices, the ISO1042DWEVM and ISO1042DWVEVM are available for US$49.00 each through the TI store and authorized distributors.